The eReefs Data Provider Nodes (DPN) represent a collections of data products and services that are brought together under a structured framework according to the “Data Provider Node Ontology”. This ontology provides a mechanism for describing the products and services contained within a Data Provider Node. This structured information, along with the adoption of a formal water quality vocabulary, allows all data services within a Data Provider Node to be described uniformly, enabling greater discovery and access to different types of data and data services. Multiple DPNs are aggregated into the eReefs Data Brokering Layer. 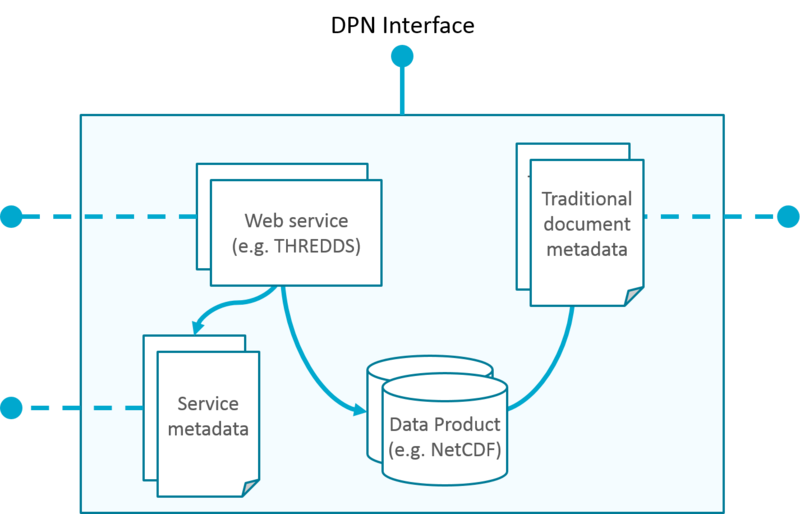 A Data Provider Node contains a collection of data products, data services, metadata and service metadata. These can be provided from different servers or technologies but are all described in a similar way using the DPN Ontology. The DPN interface allows the DPN to be harvested by the Data Brokering Layer. The individual data services (dotted lines) are still directly accessible if needed. For the purposes of eReefs, DPNs need to adopt a set of conventions for consistent data publication and enhancing access, discoverability, integration and aggregation of the various datasets. Configure services to link to Water Quality vocabulary URIs for definitions and metadata. The DPN Ontology is a formal framework for providing lightweight metadata about the services, the DPN itself, service interfaces, dataset content, provenance, and physical web service endpoints. eReefs adopted a machine-readable and semantically rich approach so that tools can be used to automate the discovery of services and datasets. Lightweight RDF/OWL ontologies are used to describe the services and datasets that a data provider may host and publish as a mechanism for capturing the appropriate metadata for a DPN. The semantic service descriptions can then be used to verify and validate a DPN according to the eReefs conventions. Meeting eReefs conventions means that a DPN can then be integrated as part of the eReefs information architecture. It also enables tooling to be developed to perform automated discovery of services and datasets, as well as begin to do semantic brokering between user request for datasets and DPN datasets. The Data Provider Node ontology is described in full on the CSIRO eReefs Wiki. DPN-O is publicly accessible at http://environment.data.gov.au/def/dpn. Data Provider Nodes are aggregated into and accessed via the Data Brokering Layer.